New York, 1953, 2-3-4-5th USA or UK edition. 316 pages [288 pages in the UK ed], 3 color photos, 25 b/w photos, 8 maps, 1 fold-out. Hardcover, no dust jacket, Very Good. This book is Very Good condition, and it may have a previous owner's name on the FEP, or a bookplate, or a presentation (many were given as gifts in 1953), and may be foxed, and have a faded spine or other flaws. (We have multiple copies). But his signature is terrific, and the page he signed is also Fine. The book is a 65 year old hardcover in Very Good or better overall condition. We met with Maurice Herzog many times in the 1990s and 2000s. The photo below was taken at the Beverly Hilton Hotel in LA; we also met him in Aspen several times, and finally visited him in Paris at his home and office twice. He was a very generous man, and was a great hero to the French people. Mauirce Herzog signing a copy of Annapurna. Note how he held the pen without fingers. 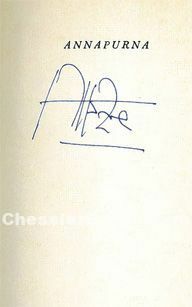 Herzog's signature was very stylized; his actual handwriting was very legible. While Maurice Herzog was alive, we visited him many times in Paris, Aspen, and San Francisco, and he autographed many books for us. 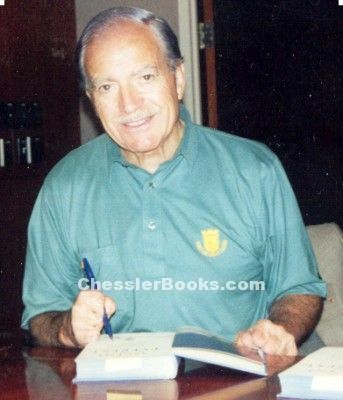 As he was in his 80s and 90s, we realized we could not wait until we had only perfect copies for him to autograph, so he signed many VG books without dust jackets. Since 2013, we have bought copies in order to obtain dust jackets for the signed books we have, so we have a surplus of unsigned copies without dust jacket, and are pricing them very low. The medical treatment they received by the expedition doctor was unbelievable and almost primitive. Employing treatments for frostbite that have since fallen onto disrepute (excruciatingly painful arterial injections, for example), the doctor was almost frightening, at times. The reader cannot help but feel pity for the suffering the injured climbers endured: maggot-ridden flesh, amputations without anesthesia, and lack of proper medical care for a protracted period of time. Translated from the French by Nea Morin and Janet Adam Smith. Introduction by Eric Shipton.